Our Creamy Beef & Noodles was crafted with beef lovers in mind. 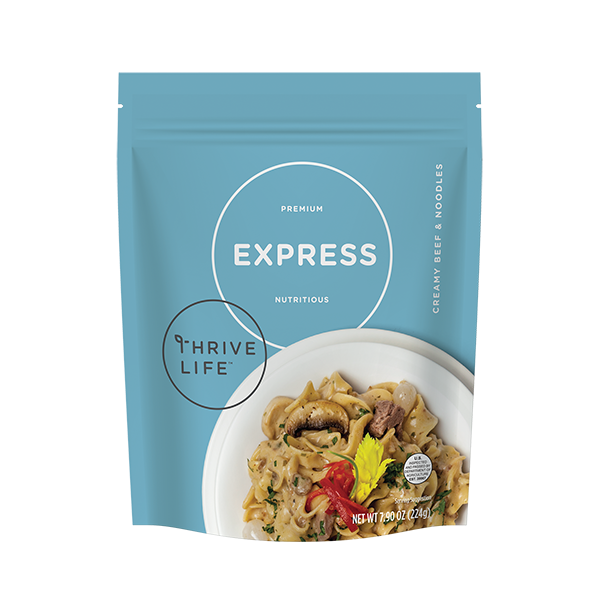 Formulated in-house with Thrive Life Onions, Mushroom Pieces, and Beef Dices, it's sure to satisfy! Curly Ribbon Pasta (Durum wheat semolina (enriched with iron (ferrous sulfate), and B vitamins (niacin, thiamin mononitrate, riboflavin, folic acid))), Espagnole (Food Starch-Modified, Salt, Potato Starch, Sweet Cream, Maltodextrin, Yeast Extract, Tomato Powder, Sugar, Nonfat Milk Solids, Powdered Cooked Beef, Beef Fat, Dextrose, Garlic Powder, Caramel Color, Beef Extract, Natural Flavor, Guar Gum, Onion Powder, Spices, Xanthan Gum, Sodium Caseinate, Sodium Phosphate, Silicon Dioxide (anticaking agent), Lactic Acid, Calcium Lactate, Annatto Color), Sour Cream Powder (Cream, Cultures & Lactic Acid, Cultured Nonfat Milk Solids, and Citric Acid), Freeze Dried Cooked Seasoned Crumbled Beef (freeze dried beef, salt, flavoring), Cream Powder (Cream, Nonfat Dry Milk, Tocopherols, and Ascorbyl Palmitate), Mushrooms, Food Starch-Modified, Onions, Butter Powder (Butter (Sweet Cream, Salt, Annatto Color), Nonfat Milk Solids, Sodium Caseinate and Disodium Phosphate), Granulated Garlic, Red Wine Powder (Glucose Syrup, Solid Red Wine), Peppercorn Blend (Spices, Red and Green Dehydrated Bell Pepper, and less than 2% Sunflower Oil to prevent caking), Dill, Parsley, Chives, Rosemary Extract. 1. Bring 3 1/2 cups of water to a boil.